In a room full of economists, I'm the only one who runs regressions on a 5-ounce phone. My colleagues still carry 5-pound laptops. Major vendors of mathematical and statistical software have only produced apps that connect to another computer or a proprietary server. By contrast, I can solve differential equations, plot likelihood functions and run regressions directly on my phone. It's a nice "on the go" solution and it's a relaxing way to work. With Debian installed on my Android phone, I can run R scripts and Perl scripts directly on my phone. And, if I'm teaching class, I can project X11 applications like wxMaxima and Gretl from my phone onto the screen behind me. 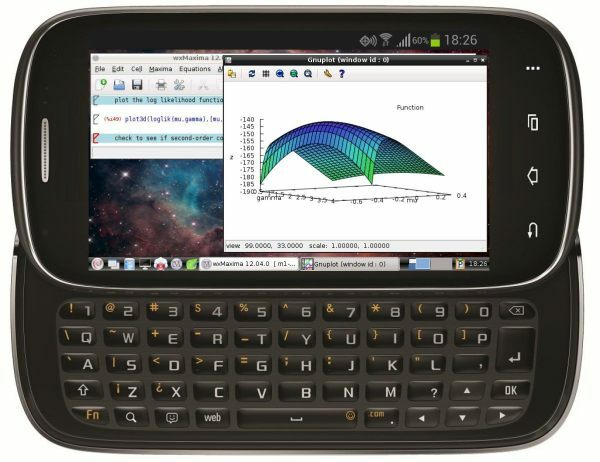 Nonetheless, it seems strange to me that today (in 2016), eight years after the first commercial release of an Android phone, that Debian is the only provider of fully-featured mathematical and statistical tools that run on an Android phone. This HowTo explains to how to run Debian on an Android phone (or tablet), but because it is very long, I host it at my own site. While you're there, download the installer and check out my screenshots. I would also appreciate any suggestions. Please add them to the discussion thread.